With SharePoint 2010, there are no obscure methods or actions required to limit SharePoint Designer access, they’ve moved it into the Site Collection Administration! To view/modify these settings, go up to your site collection level, and look under the Site Collection Administration custom action group on the Site Settings page, and click on the SharePoint Designer Settings link towards the bottom. 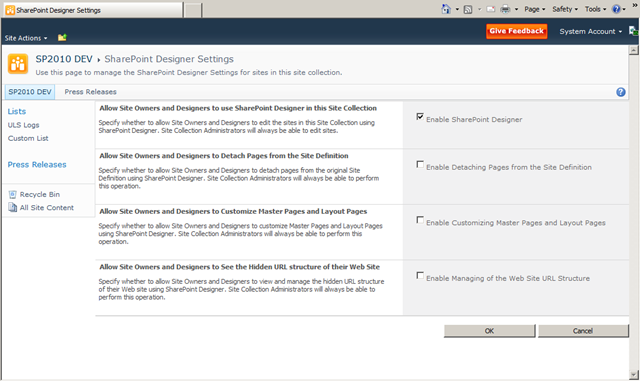 From here, you can enable or disable SharePoint designer access to the entire site collection. And you can even go as far as enabled detaching pages from the site definition (unghosting pages), enable or disabling access to modify master and layout pages, and the ability to manage the site hierarchy. 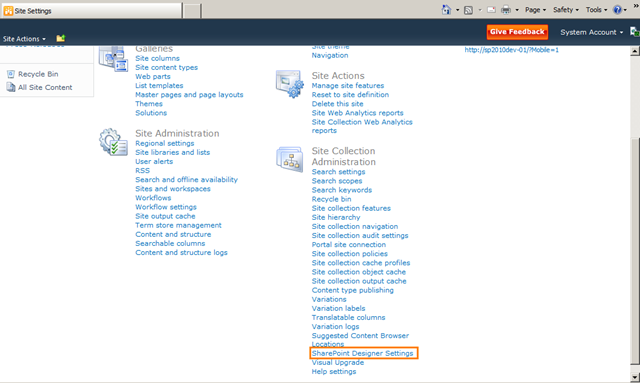 A short but sweet post, but just another one of the new great features available in SharePoint 2010 (as of Beta 2).